Luke Lowings MA (RCA) ARB was born in Cambridge, England (1961) and studied Architecture at Kingston Polytechnic and the Royal College of Art, following a Foundation Course in Art and Design. 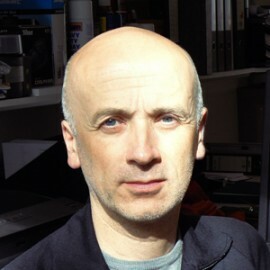 After working in London (for Richard Rogers’ office among others), he moved to New York in 1989 and for twelve years worked as a collaborator in the studio of sculptor James Carpenter, testing the relationship of light, structure and material in architecture. During that period he became a registered architect in the UK and New York State. In 2001 he returned to London, setting up a partnership with James to continue their explorations. For over twenty years, Luke has worked with glass and light, on a diverse range of projects all over the world, from domestic-scale installations to large tension-net façades, bridge designs, and artworks integrated into infrastructure projects. This has produced a unique body of work spanning the disciplines of art, architecture and engineering, always linked by a fascination with the integration of light into the experience of public space. With his studio and in close collaboration with engineers, all aspects of project responsibilities are developed, from design and construction documentation, to fabrication and installation. Luke’s work has been recognised over the years with a Young Architect’s Forum prize from the Architectural League of New York, an FX Design Award for the Light Helix at the Royal Albert Hall, London, a GSA Award for the ‘Light Ceiling’ in Phoenix, Arizona and a Progressive Architecture Award for the Twin-Mast Bridge in St Paul, Minnesota. His work has been exhibited at the Museum of Modern Art in New York and widely published in books, journals and magazines across the USA and Europe. Luke has taught at the University of Philadelphia, New Jersey Institute of Technology and Columbia University in New York. He has been a contributor to studio discussions at the Architectural Association and the Bartlett School of Architecture UCL where he currently teaches Diploma thesis. He has contributed regularly to the Lighting Design course at KTH in Stockholm and has lectured in the UK, Germany, the Netherlands, Sweden, and the USA. Luke is married with two children and lives in London. RIBA Part III Exam for ARB registration, registered architect in the UK Royal College of Art, London, MA Dip Arch. Guest Critic, Columbia University, Bennington College, NJIT, University of the Arts, Pennsylvania, Harvard, the University of Pennsylvania, in the US, and the Bartlett School in London.